Can Elinor Ostrom’s revolutionary ideas halt climate change, improve people’s livelihoods, and save the world’s forests? Thus spoke Elinor Ostrom in her 2009 Stockholm lecture, when at age 77 she became the first woman to receive the Nobel Prize in Economics. A professor of political science at Indiana University-Bloomington until her death in 2012, she’d spent a lifetime traveling the world and observing everyday citizens cooperating against all odds. Ostrom’s famous smile. Photo courtesy of the International Land Coalition under a Creative Commons license from Flickr.com. Ostrom frequently encountered groups of people managing commonly shared resources, creating systems based on trust, such as peasant farmers in Nepal cooperatively managing simple irrigation systems, and people working to solve human-wildlife conflict with forest elephants in Kenya. Why, she wondered, were these people sacrificing their own time and energy to collectively solve social and environmental problems, creating local institutions that lasted many generations? Such collective behavior flew in the face of the longstanding theory of the day, which said that people will selfishly take whatever they can, ultimately causing a “tragedy of the commons” – depleting fish stocks, destroying forests and pastures, usurping groundwater, and otherwise destroying the planet and ultimately, their own livelihoods. People, so the theory went, were too stupid or selfish to solve their own problems and needed regulation by market forces or a top-down government, or the planet was toast. Yet through trial and error and much research, Ostrom had found the secret. “When people have trust that others are going to reciprocate and be trustworthy, including their officials, they will be highly cooperative,” Ostrom said in an interview with journalists after the Nobel Committee announced her prize. “When there’s no trust, no matter how much force is threatened, people won’t cooperate unless immediately facing a gun.” When people don’t trust others, they “cheat” – breaking rules and seeking their own self-interest. 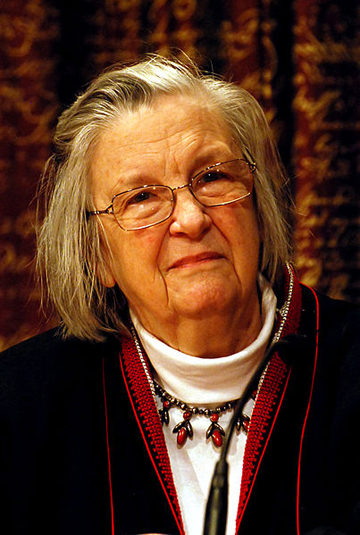 In her 1990 book Governing the Commons – which the Nobel Committee called her most important contribution – Ostrom proposed eight “design principles” (see Sidebar) that she found were consistently present in sustainable, cooperatively managed commons (any resource shared by multiple people). Drawn from several decades of research, Ostrom’s insights stemmed from personally witnessing examples in the real world, but she named the specific principles by statistically analyzing thousands of published studies in many fields. 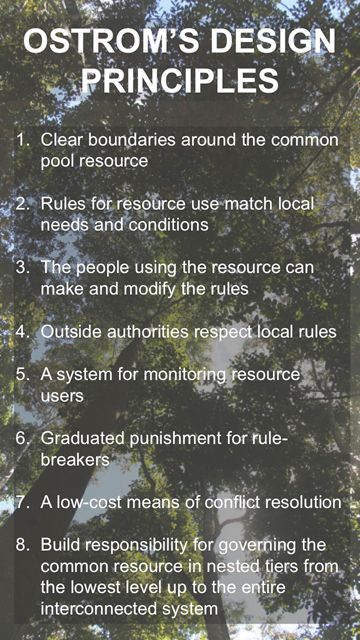 Ostrom found environmentally and socially sustainable ‘common pool resources’ had several of these principles in place. 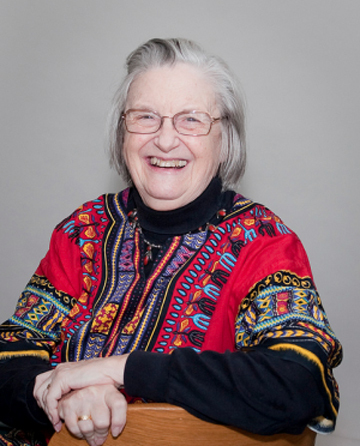 Ostrom’s work lives on at Indiana University’s Vincent and Elinor Ostrom Workshop in Political Theory and Policy Analysis, and in the many scholars and colleagues who continue to study, refine, and apply her theories in the real world. However, her untimely death from pancreatic cancer three years after receiving the highest honor in her field deprived her work of a folksy, outspoken, kind-hearted champion of the common man and woman. “She had incredible energy and determination, and an easy way of communicating with ordinary people,” says her colleague Mike McGinnis, IU political science professor and Workshop member. Vincent and Elinor Ostrom Founded The Workshop in Political Theory and Policy Analysis in the 1970s, where Lin co-directed it until her death in 2012. 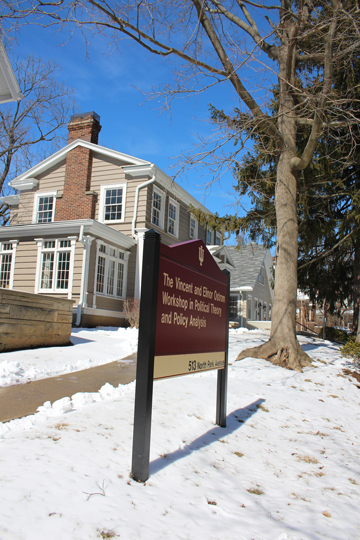 It is housed in an old house on the Indiana University-Bloomington campus, and Workshop members (professors, graduate students, postdocs, and visiting scholars) have offices in this as well as two neighboring buildings. Photo (c) copyright 2014 Wendee Nicole. The Nobel brought Ostrom’s already robust theories greater acclaim, and the theories remain super-hot in academic circles, yet her lessons have yet to be fully absorbed into global policy. While many countries have now embraced some forms of decentralization – giving more power to regional and local authorities – these policies do not always mean local people are given more influene. And among the general public there remains a general lack of awareness of Ostrom’s revolutionary ideas; say “polycentricity” or “commons” to a friend, and watch their eyes glaze over. Yet Ostrom’s theories cut across political party lines and offer deep, meaningful insights about how to manage forests, fisheries, and communities – all of which are in flux as global climate change may reach crisis proportions in the coming decades. In her latter years, Ostrom grew deeply concerned that the United Nations REDD+ [reducing emissions from deforestation and forest degradation] mechanism would lead to more, not less, deforestation if indigenous and local people are not given rights and land tenure, and she openly discussed the applicability of her research to global climate negotiations. Even though REDD+ policies are designed to benefit locals, without land tenure, those policies could lead to evictions of forest users when people with more power and wealth engage in a “carbon grab,” as a recently publishedreport called it. “If local users and Indigenous peoples in the developing world are not recognized and assigned clear rights, REDD could lead to more deforestation,” Ostrom said at the 2009 United Nations Climate Change Conference of the Parties (COP15) in Copenhagen. Neglecting her work could be suicidal in times such as these. A portrait of Ostrom at the conference with the laureates of the memorial prize in economic sciences in 2009. Photo courtesy of Holger Motzkau 2010, under a Creative Commons Attribution-Share Alike 3.0 Unported license. She knew the theory must be wrong, because the real world was staring her in the face. Game theory came into the public consciousness with the 2001 biopic A Beautiful Mind, about the life of Economics Nobel Laureate John Forbes Nash. The movie simplified his theory this way: most guys go for the best-looking girl (“the blonde”), resulting in a lot of losers since only one gets the girl. In a similar vein, biologist Garrett Hardin theorized in his famous 1968 Science article, “Tragedy of the Commons,” that people adding cows to a commonly used pasture would act selfishly, ignoring the collective good. With daily news reporting razed tropical forests, biological extinctions, eroded and desertified land and an atmosphere rapidly accumulating CO2, it seems that these theories match reality. Why then, did Ostrom keep finding real-world situations that defied the predictions? Batwa men and women in Uganda’s Makongoro village process reeds from the forest to weave baskets which they sell to make money for their families and communities. Now conservation refugees evicted from their traditional forest home, now they must receive permits from the Ugandan government to harvest forest products, but most are not educated and need assistance to fill out forms and paperwork. In contrast with Ostrom’s design principles, the government did not actively consult the Batwa when evicting them from the forest but chased them out with guns, giving no land or resources to establish new lives. Photo (c) copyright 2014 Wendee Nicole. Taking Hardin, Nash and similar theorists to heart, policymakers opted for two opposite solutions to protecting the commons: privatize natural resources (leading to “payment for ecosystem services” type projects), or have governments lock natural areas up in preserves. The latter usually meant stripping rights from locals who had long used these commons for subsistence fishing or hunting, or in the case of forests, gathering firewood, medicinal plants, and other forest products. Many governments (supported by large conservation organizations) evicted indigenous peoples from their homeland in the belief they damaged ecosystems. Ostrom’s research found that such policies are sometimes counterproductive. Many of the evicted people receive little or no government assistance and end up as “conservation refugees,” adrift with nowhere to go and no means to support themselves. In Uganda, indigenous Batwa forest pygmies lived within the Echuya Forest Reserve, acting as forest monitors for non-indigenous locals who could only access the forest once per week. 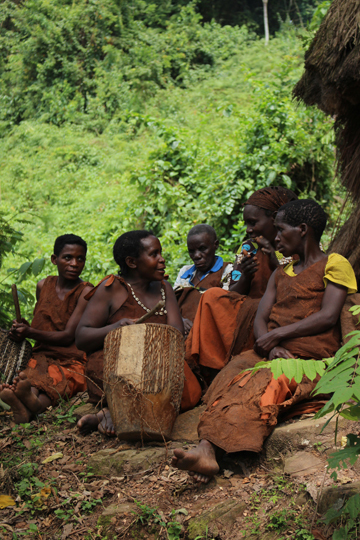 Compared to four other community-managed forests where Batwa did not live, the Echuya forest experienced the least illegal firewood harvest and other non-sanctioned activities. Yet in 1992, Uganda evicted Batwa from all government forests in order to create national parks for tourism. Regaining rights to harvest forest products has been a slow, uneven process and these indigenous people now suffer some of the worst poverty in all of Uganda. As Ostrom’s theories would predict, evidence suggests that poaching and illegal access of the forest have increased since the Batwa were evicted. 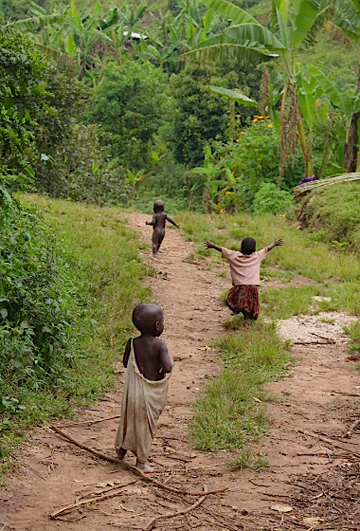 Three young Batwa children run and play in their land adjacent to Uganda’s Bwindi Impenetrable National Park. The Batwa were evicted by the government in 1991 and now live as conservation refugees outside the park, often in extreme poverty. Research by Workshop scholar Abwoli Banana (who runs the Uganda IFRI Center) showed that forests in which Batwa lived before their eviction had less, not more, forest degradation, than other community-managed forests, which matches Ostrom’s theories. Photo (c) copyright 2014 Wendee Nicole. “There are environments, especially in some of the developing world, where [locals’] own institutions that had evolved over long periods of time were taken away from them. They’ve lived under top-down regimes and some of the trust and capability of working together have been destroyed,” Ostrom said in a documentary created about the 2009 Economics Nobel Laureates, herself and Oliver Williamson. “It’s very hard to re-establish [trust] once you’ve taken it away.” Ostroms found that taking rights away from locals and indigenous can lead to more, not less, forest degradation. Described by The Economist as “a little like Agatha Christie’s detective, Jane Marple, apparently a bit sweet and scatty, in reality sharp as a paper cut,” Ostrom was remarkably far-sighted in her long, illustrious career. “I’ve never met anyone like her in my life. She was a ball of energy,” says Burnell Fischer, her IU colleague and current co-director of the Workshop in Political Theory and Policy Analysis, which Ostrom directed until she died in June 2012. (Her husband, Vincent Ostrom, died within weeks of Lin’s passing). “Stories of Ostrom’s collaborative genius are legion: suggesting just the right article or idea to jump-start a dissertation; making a contact that launches a recently minted Ph.D.’s career,” wrote Jeremy Shere in IU’s SPEA (School of Public and Environmental Affairs) magazine. Born Elinor Awan, her life – and her interest in cooperation – began under less than ideal circumstances. Raised mainly by a single mom in Los Angeles during the Depression, she first saw people cooperating during the war, planting victory gardens and voluntarily limiting the use of their resources. Whatever passions drove her, Ostrom overcame obstacles throughout her life with a surprising degree of self-confidence. Peers taunted her over her father’s Jewish heritage, even though she attended her mother’s Protestant church, and setbacks she experienced as a woman in academia gave her much empathy for those who experience discrimination. Setbacks only seemed to push her forward. 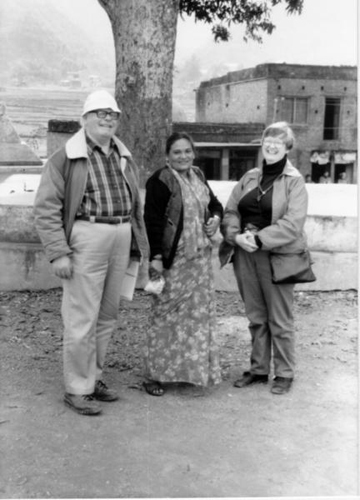 Photo taken January 1992 of Vincent Ostrom, Tej Kumari Mahat (chair person of the FMIS in Sera-baguwa bandh irrigation system, Tharpu, Tanahu) and Elinor Ostrom in Tharpu village, Tanahu. Photo under the Digital Library of the Commons. After her divorce in the early 1960s, she returned to L.A. and was easily accepted in a political science Masters program at UCLA, but applying for a doctorate proved challenging. She wanted a Ph.D. in Economics, but did not have enough mathematics because her undergraduate advisors had dissuaded her from those classes. But soon she became one of four women – the first in 40 years — accepted into the political science Ph.D. program after the department faculty argued vehemently over whether to admit any women. Lin – as everyone called her – met her second husband Vincent Ostrom in a seminar in which each student picked a groundwater basin in southern California to study. They soon fell in love, and married in 1963. She continued studying irrigation systems for her graduate research, and when Hardin published his famous “Tragedy of the Commons” article, she was immediately skeptical – and stayed so, eventually showing that his theory was wrong in many situations. Lin followed Vincent to Indiana University, where he got a job as a tenure-track professor and she was hired only as a lecturer. As the Vietnam War escalated, the political science department asked her to serve as graduate advisor to some 90 students, at which point she negotiated to have IU hire her as a full-time faculty member. During the 1970s, she and Vincent, who made furniture as a hobby, created the “Workshop in Political Theory”, modeled after an artisan-style woodworkers’ workshop, where people from varied disciplines could collaborate, brainstorm, and hammer out ideas. The workshop and the offices the Ostroms filled with their larger-than-life personalities are located in a large old house on the IU-Bloomington campus. In the mid-1980s, the U.S. National Academy of Sciences gathered researchers from varied fields together, including Ostrom, to compile data on the management of common pool resources around the world. The NAS work resulted in the Common Pool Resource Database, still online, and Ostrom’s book, Governing the Commons. As she tested what made people cooperate and self-organize and worked on her book while on a sabbatical in Germany, she became exasperated. 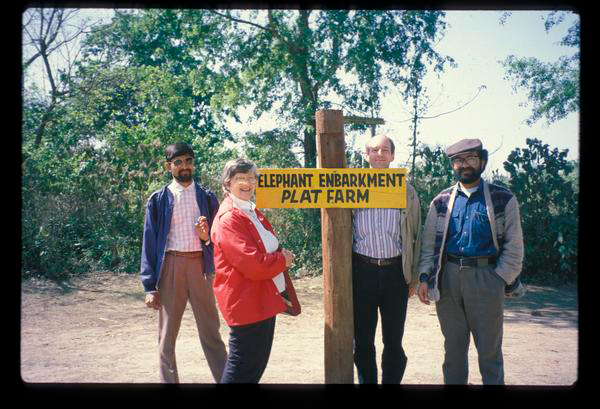 Photo taken March 1993 of elephant embankment platform in Ghadgain, (L to R) Indra Sharan K.C., Douglas Vermillion, Elinor Ostrom and Rabi Poudel during the final day of Workshop outing to the RCNP. Photo under the Digital Library of the Commons. “I tried to move up a level – [to ask] what were the generalities across the systems,” she explained in the NobelPrize.org interview. “Maybe we could call it best practices.” These became her eight design principles present in successful “institutions” and missing from unsuccessful ones. As it turns out, Ostrom’s real-world observations matched what she and her colleagues found in their social science lab experiments beginning in the 1980s: communication completely changed the classic game theory predictions that the optimal behavior was to act selfishly or “cheat” rather than cooperate. In each experiment, eight people sat at computers and had the ability to “invest” either in a commonly shared resource, or in a private fund. The commons paid better – up to a point – just like a pasture that is vulnerable to overcrowding, or a forest that can be used sustainably or overharvested. “When subjects … couldn’t communicate, the theory was right. They overharvested even worse than predicted,” Ostrom describes in her Nobel lecture. “However, when they could communicate face to face, theory was wrong.” Trust could be achieved through simple communication. It was a radical breakthrough: the commons need not be a tragedy. Methodist Primary School building. 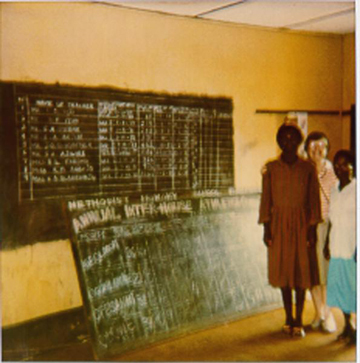 Elinor Ostrom standing in a school room with one teacher and one student posing in front of the blackboard. Photo under the Digital Library of the Commons. As Ostrom became more involved in ecology and forestry research in the 1990s, the United Nations Food & Agriculture Organization (FAO) came to her, wanting systematic information on global forests and the people depending on them. She founded the International Forestry Resources and Institutions (IFRI) research network, still the only interdisciplinary, long-term research program focusing on both forests and social-ecological conditions. Researchers in the 15 centers around the world – including Tanzania, Uganda, Bolivia, Nepal, and India – use a common set of research protocols to facilitate global research. In the last decade of her life, Ostrom became increasingly vocal about how her findings applied to climate negotiations, particularly REDD+ policies, which many indigenous groups oppose. REDD is a “market” mechanism, which compensates landowners either to maintain existing forest or plant new trees, but indigenous and locals relying on forests fear it may concentrate wealth in the hands of a few and cause conflict among neighbors. Also, many indigenous and local forest dwellers do not have formal tenure rights to the land they live on and use, which REDD requires; international markets are unable to compensate people who do not have secure land ownership, which offers no guarantee forests will remain intact. Having seen how powerful governments and, environmental groups have at times trampled the rights of locals and indigenous groups, Ostrom was concerned. “I hope in our negotiations that … we are very, very careful to be sure that the rights of indigenous people and local owners that have not been recognized in the past are recognized, protected, and that they’re given a chance to get technical advice,” she said at COP15. At the time, REDD policies were still being negotiated, and since the Warsaw framework for REDD+ was passed in November 2013, such projects have started around the world. But Ostrom’s research suggests that if REDD+ policies are merely designed by top-level authorities, without involvement of the local people who use the forests, the policies will fail to create the trust necessary for sustainable community-managed forests, and could instead lead to forest degradation and loss. Ostrom had strong views on REDD, but according to her colleagues she was not anti-market, despite what some detractors have claimed. Neither is she anti-state, although her work has been both praised and criticized by people of varying political bents. 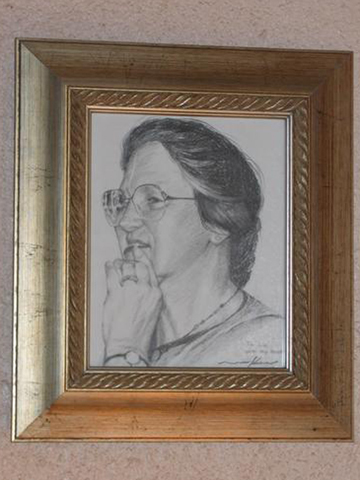 Framed pencil drawing of Elinor Ostrom that hang at the University of Mande Bukari. Photo under the Digital Library of the Commons. Too often, though, top-down governments interfere with the solutions locals have crafted, as happens when governments evict indigenous people from their homelands, or government corruption wreaks havoc on local projects. Local projects can succeed even if higher governments are not supporting them, so long as they do not interfere. One design principle with very strong empirical support is having locals monitor the use of a resource. “In sustainable forests around the world, the users are the active monitors of the level of harvest occurring in the forests,” Ostrom explained in her Nobel lecture. But the effectiveness of the monitoring depends on who does it. “Users monitoring forests is more [effective] than when government does it.” Also, as Ostrom saw in Nepal, resource users sanction others, but in a graduated way for repeat offenses. Draconian punishment for first-time infractions ends up causing mistrust and resentment, leading to less willingness to cooperate, she found. 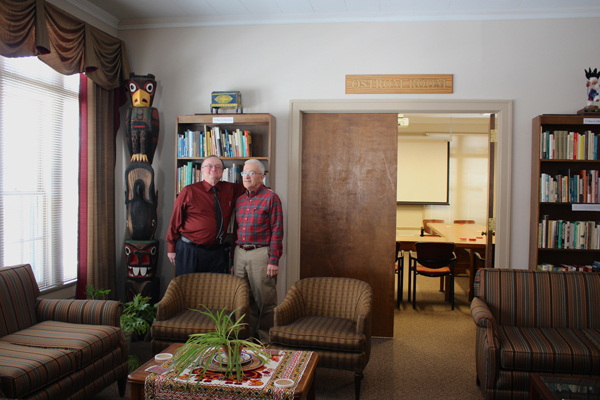 Indiana University-Blooomington Professors Mike McGinnis and Burnell Fischer near the Ostrom Room inside the The Vincent and Elinor Ostrom Workshop in Political Theory and Policy Analysis on campus. Photo (c) copyright 2014 Wendee Nicole. For example, even without federal emissions-reductions targets, at least 30 U.S. states have developed climate action plans and more than 1,000 cities have signed the U.S. Mayors Climate Protection Agreement. Individuals, communities, and groups can also take action. 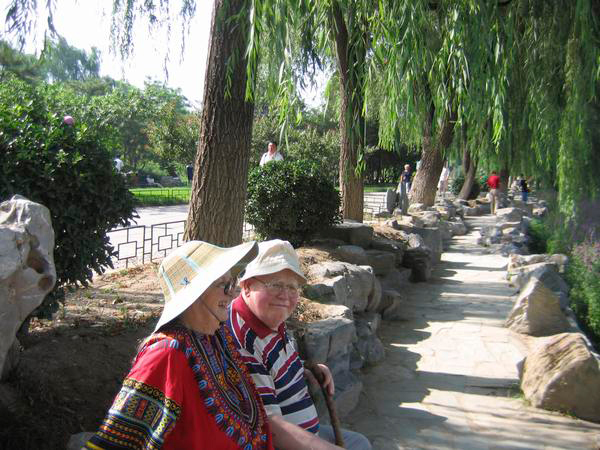 Elinor and Vincent Ostrom at Yuan Ming Yuan Gardens. Photo under the Digital Library of the Commons.